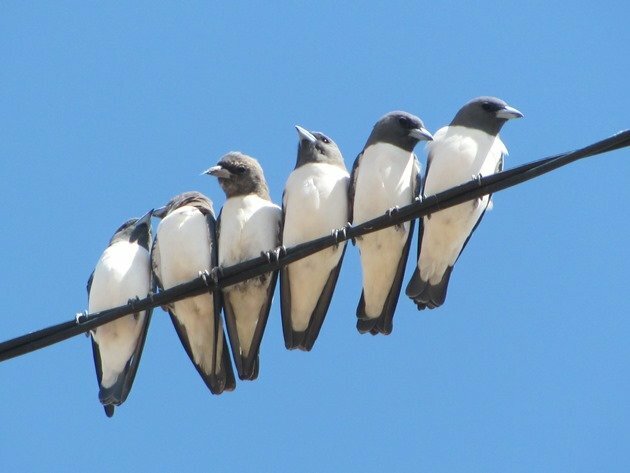 A few weeks ago I mentioned the Dollarbirds around Broome that love to use our power lines for roosting and then swooping down chasing insects. 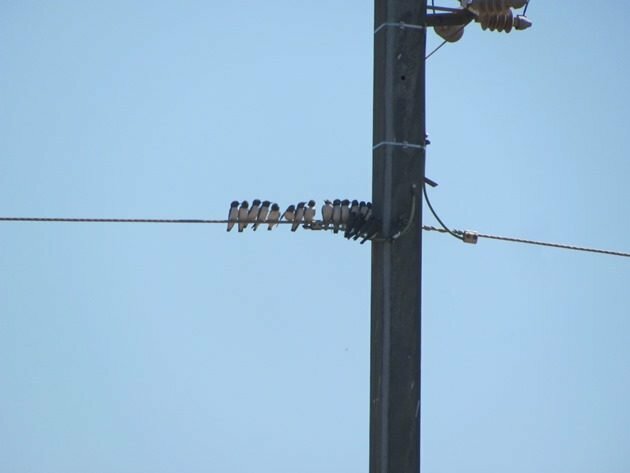 They like to take a whole power line section to themselves around Broome and now they are in the countries to the north of us they are no doubt using the same method for chasing insects. 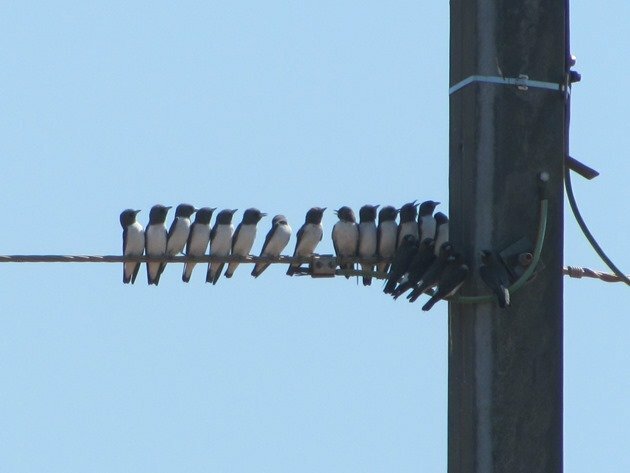 Our local White-breasted Woodswallows are the exact opposite in that they love to huddle together! As is the case with numerous bird names in Australia the White-breasted Woodswallow does indeed have a white breast. 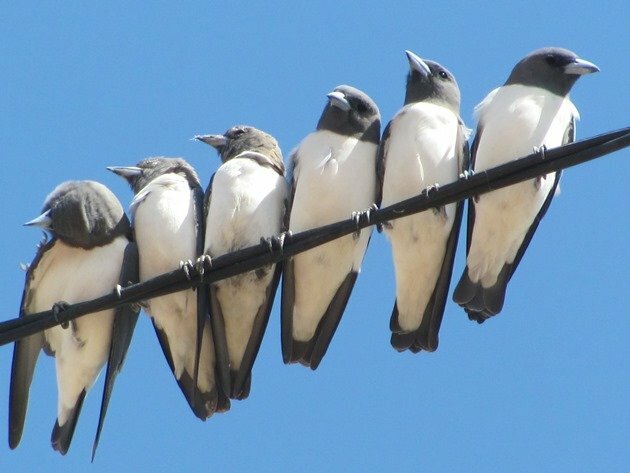 Not only that, but the Black-faced Woodswallow has a black face and the Little Woodswallow is small and chocolate brown! 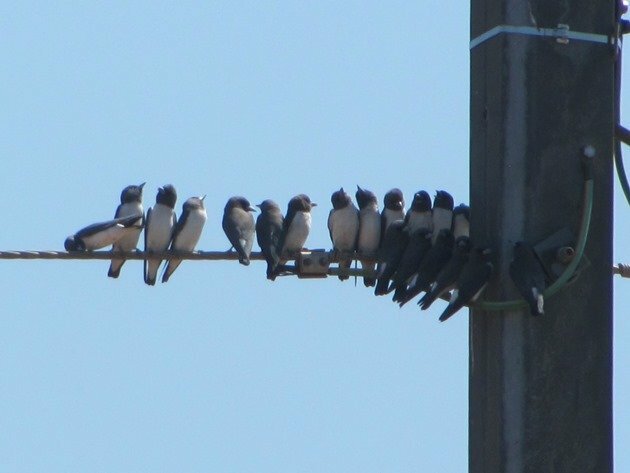 When the White-breasted Woodswallows huddle together it is not necessarily because it is cold, but because they are fighting over what little shade there is. In the photos above and below it was 40c/104f and the only shade was that produced by the power pole itself. They were constantly jiggling each other off the near end to get the most shade and using all of the available cabling. It was amusing to watch them go catch a few insects and then return to try and squeeze in close to the main pole to take advantage of the shade. White-breasted Woodswallows fighting for shade! 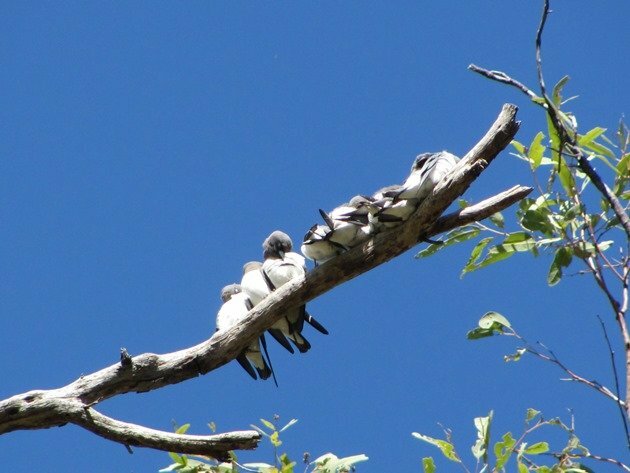 Another small flock of White-breasted Woodswallows had given up on fighting over shade, but still chose to roost close together despite the heat. It is a definite characteristic of this species and is a familiar sight across the north of Australia with some flocks of around one hundred birds. The small flock below appeared to have some younger birds among it. 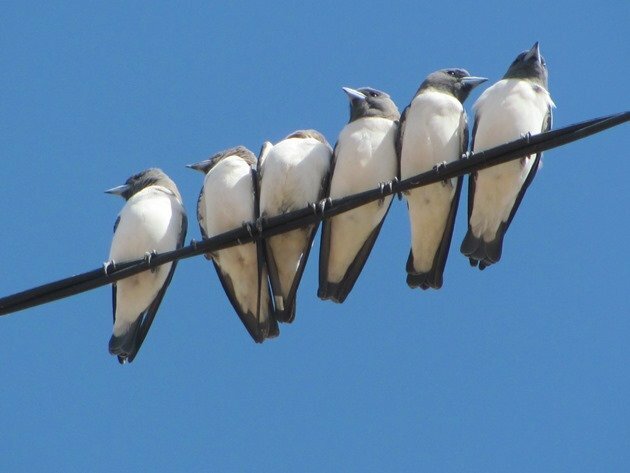 White-breasted Woodswallows are a familiar sight huddled together on power lines, but in areas with tall trees that is their preferred roost. More shade is available and they can still swoop down chasing insects. Obviously they don’t quite stand out as well in trees as they do on power lines! 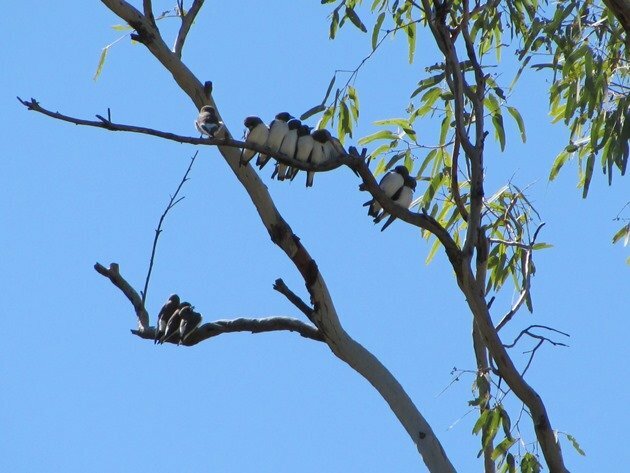 As our night time temperatures are starting to cool down here in Broome the White-breasted Woodswallows will be cuddling closer together! Yes, we do have very blue sky here in the north of Australia! With very little to pollute the sky it is something you rarely get bored of. It gets quite exciting if a cloud shows up! Happy Global Big Day from Costa Rica!